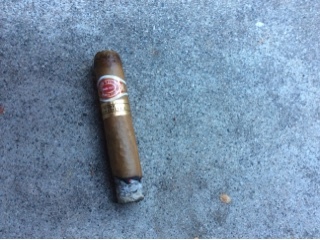 The Romeo y Julieta is a classic looking habano smoke. This is a cigar that needs a good hour, with uninterrupted time in your favorite chair. I smoked it on a pleasant cooler Los Angeles afternoon. Impressive looking with an attractive wrapper with an oily feel. Let’s do it and smoke away. It started with creamy note of chocolate and almonds. Very smooth and flavorful but I expected a more spicy start. Very easy draw, medium in scope, not much heat. After the first third still very smooth and the nutty profile hangs with us. Medium with perhaps a slight pepper aftertaste. As we approach the end of the smoke, the burn becomes uneven which impact the appearance for sure. It also got somewhat bitter which knocked the overall experience down a peg. 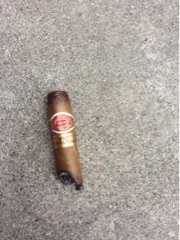 Overall a top flight smoke with a couple of minor imperfections . Here are my final numbers and rating. If this smoke is available grab it.